A JSTO is a Junior State Thespian Officer in Grades 6, 7 or 8. 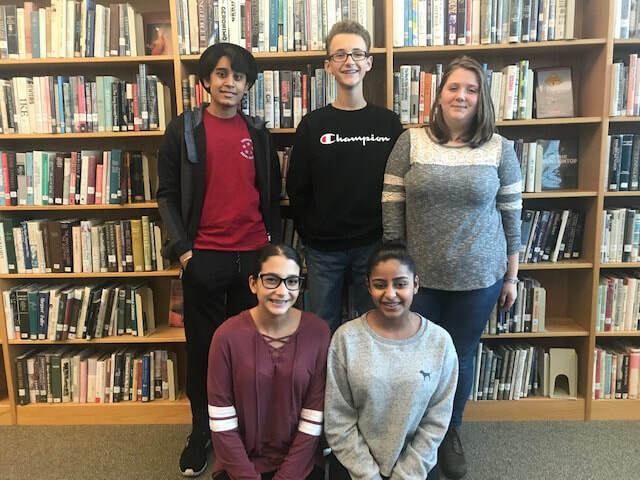 Their main jobs are to help plan, manage, and host the New Jersey Junior Thespian Festival immediately following their election. ​Additionally, the JSTO serve as the primary voice and advocate of NJ Junior Thespian students on the NJ Junior Thespian State Board. JSTO are given volunteer hours for their service to the International Thespian Society. Shreeya is happy to be a JSTO this year because she loves theatre. Shreeya is in 8th grade and attends D.D. Eisenhower in Freehold, NJ. In school, Shreeya participates in activities including: drama, playing the bass, guitar, piano, and singing. In the community, she does music, and helps out at elementary schools. Shreeya's hobbies are playing the bass, ukulele, piano, guitar, and vocals. Her favorite musical is Wicked. Shreeya cannot wait for Jr. Thes Fest 2019 because she wasn't able to go last year and she is excited. Michael is excited to be a JSTO this year because he wants to contribute to the Thespian Festival. 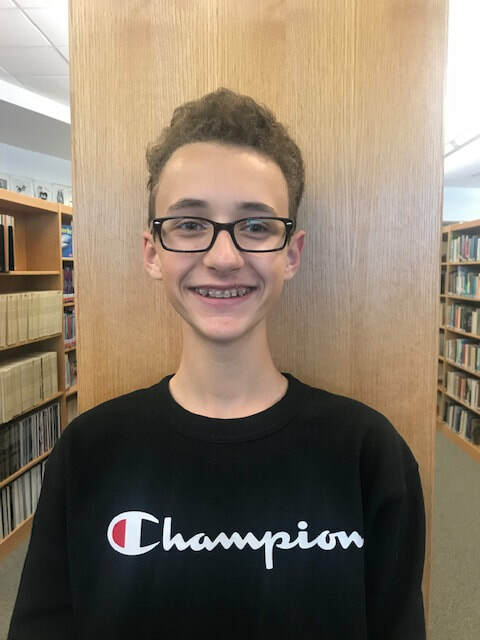 Michael is in the 8th grade and attends Ranney School in Tinton Falls, New Jersey. In school, Michael participates in activities including: the school plays, orchestra, and forensics. In the community he is a Jr. Tri-M officer. Michael’s hobbies are playing guitar, violin, and reading. His favorite musical is Matilda. Michael cannot wait for Jr. Thes Fest 2019 because it is fun to learn bunch of new theatre tricks and tips. Kiri is glad to be a JSTO this year because it was fun last year. 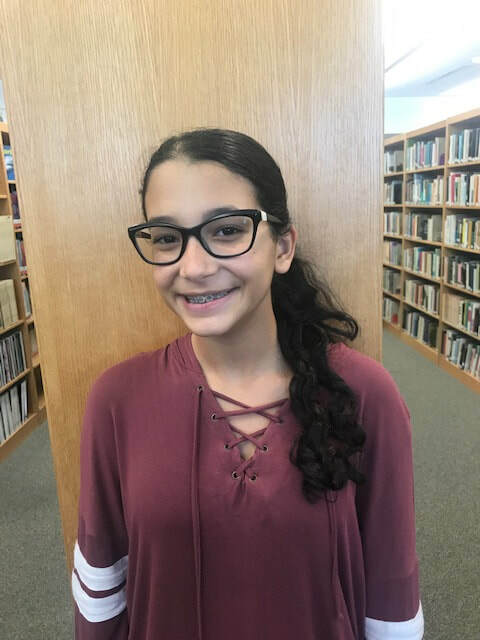 Kiri is in 8th grade and attends Ranney School in Tinton, New Jersey. In school, Kiri participates in activities including: orchestra, field hockey, and painting. In the community she helps in Jr. Tri-M, Kiri’s hobbies are ukulele and viola. Her favorite musical is Groundhog Day. Kiri cannot wait for Jr. Thes Fest 2019 because it’s fun! Amrik is cheerful to be a JSTO this year because he loves drama. 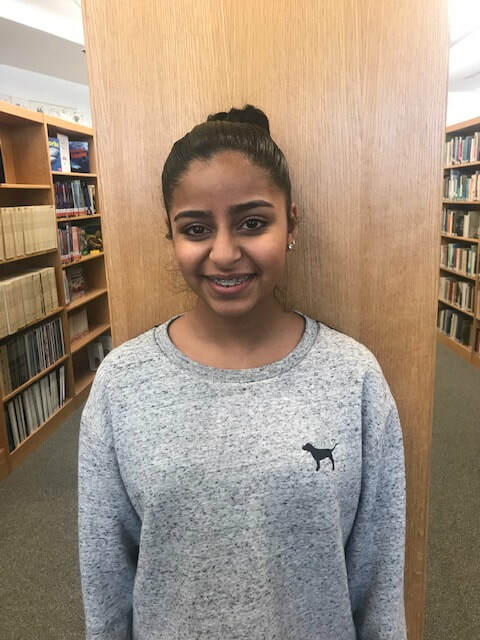 Amrik is in 8th grade and attends D. D. Eisenhower in Freehold, New Jersey. In school, Amrik participates in activities including: drama, stem club, tech ninjas, academic team, and robotics. In the community, he has cleaned parks and helped at elderly homes. 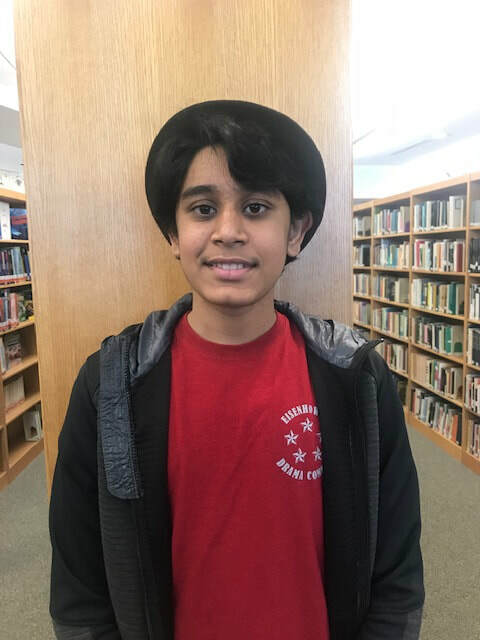 Amrik’s hobbies are reading, video games, and memes. His favorite musical is Grease. Amrik cannot wait for Jr. Thes Fest 2019 because it was very enjoyable last year. Olivia is excited to be a JSTO this year because she loves all things theatre! 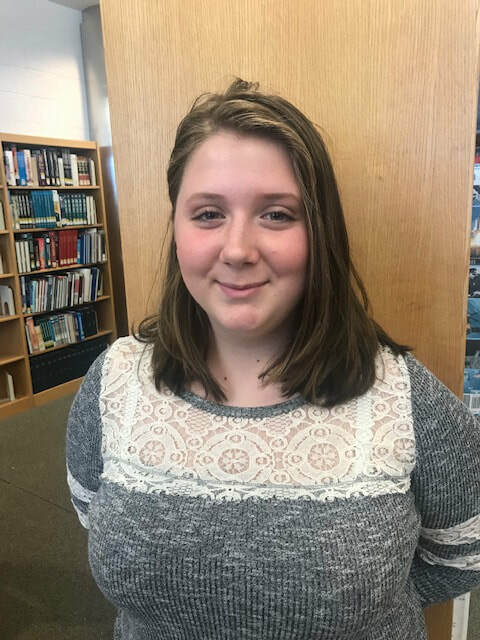 Olivia is in 8th grade and attends Dwight D. Eisenhower in Freehold New Jersey. In school, Olivia participates in activities including: school drama club, Tri-M Music Honor Society, and band. In the community she participates in many shows and takes volleyball lessons. Olivia's hobbies are dancing, playing volleyball, and singing. Her favorite musical is Wicked. Olivia cannot wait for Jr. Thes Fest 2019 becaue she can't wait to learn new theatre skills, and to be a theatre mentor! 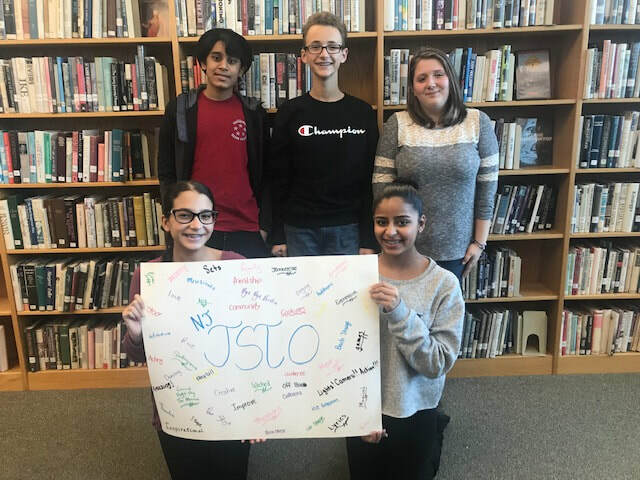 2017-2018 Inaugural JSTO were Kayleigh A. Cahill, Joseph Martinez, Sanjana Iyer, Kiri Patient, and Maya Jacoby.